All manual call points that are placed in vulnerable areas and are prone to false activations should now be protected, without the need to consult your fire safety officers. Safety Technology International (STI) supply a range of protective covers, from integral covers to sounder models; there are variations to suit all applications. 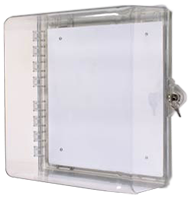 These covers are specifically designed to prevent false alarms whether accidental or malicious. STI Managing Director, Steve Hunt believes that the update to the British Standard will aid the decline in false fire alarms throughout the country. Contact sales on +44 (0)1527 520 999, email sales@sti-emea.com or visit www.sti-emea.com, for further information on the range of protective covers from STI.